​CCTV, wi-fi and enhanced mobile communications are all part of a pioneering project which was launched by BT and Gloucester City Council in 2015 driven through by Cllr Jennie Watkins based on recommendations by the team at Marketing Gloucester, who lead on the digital strategy for the city. The development – the first of its kind in the UK – included the introduction of a free public wi-fi service for tourists and people living and working in Gloucester city centre. Laptops, tablets and mobile devices will all be able to connect to it. There is also be a new state-of-the-art CCTV service and control room, and improved mobile phone coverage for 4G and other new services. Paul Coles is BT regional manager for Gloucestershire and the South West. Councillor Jennie Watkins is cabinet member for communities and neighbourhoods at Gloucester City Council. Paul Coles says the project makes Gloucester one of the best connected cities in the UK. Installation of wireless access points and 50 new high-definition CCTV cameras has taken place across the city. The new digital service provides clearer images, enable security teams to zoom in on potential trouble spots, and gather evidence with high-quality images. 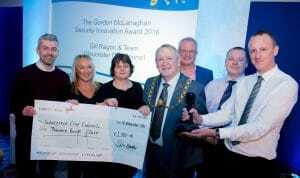 The award was made by The Right Honourable Lord Mayor of Bristol, Councillor Jeff Lovell. The council beat off stiff competition from Cumbria Police, the Metropolitan Police and North Somerset Council. In addition to winning the prestigious Bristol Blue Glass Trophy, the winners were awarded a cheque to the value of £1,000. Cellcos don’t need 5G for people to make phone calls – their existing 4G networks have more than enough bandwidth for that. Cellcos also don’t need 5G for IoT applications, except for uses such as smart cars and smart cities because most IoT devices use very little bandwidth – although some need the low-latency that 5G provides. What cellcos need is to make 5G economically feasible for them. For that cellcos need people to watch lots and lots of videos that take lots of bandwidth, especially 4K videos, live streaming, VR and AR. The thought of live streaming has cellcos drooling. Notice what Verizon said about one reason it paid almost $5 billion to acquire Yahoo – live streaming of sports. Verizon clearly has its 5G eye on wireless broadband to homes. McAdam said, “I think of 5G, initially as, in effect, wireless fiber. With wireless fiber, the so-called last mile can be a virtual connection dramatically changing our cost structure.” He said the most expensive part of deploying its FiOS fiber network is just outside and inside the home, an expense that would not exist with the use of 5G. He said that FiOS and 5G routers cost the same, but that 5G doesn’t use an optical network terminal (ONT) that is typically mounted on an outside wall. McAdam said Verizon expects there will be a significant cost reduction when 5G becomes available. Verizon, together with Ericsson and Nokia, has been testing 5G in Dallas, New Jersey and Virginia. The speeds it’s getting are truly fantastic for a wireless cellular network. McAdams said that in its tests, it has been getting speeds above 1 Gbps at over 500 yards, which is more than enough for up to six 4K TV signals, six virtual reality units and multiple smartphones and tablets. McAdam said Verizon’s now in the process of moving that work into the field, where it can start to cover 200-home developments. It will also look at some rural environments. Unlike 3G, 4G and WiFi, 5G is said to have the latency and steadfastness that, until now, only wireline networks could offer. McAdam didn’t say it specifically, but 5G, if it performs as promised, will substantially reduce the costs of building wireline broadband networks because telcos do not have to install any wiring within the last 100-500 or so yards (meters) of the home. Telcos and cablecos will still need to install fiber to within 100-500 yards of the home. At that point it will install a 5G cell, probably on a utility pole or building, and then a 5G-capable router in the home – no digging up streets and yards or installing wires on utility poles. Telcos could install fiber to an MDU (Multiplexer and Distribution Unit), of which the world has millions, and then install a 5G cell in or just outside the MDU to offer high-speed broadband to the MDU’s residences. 5G could serve broadband services providers as a wireless form of G.fast or VDSL broadband technologies – with no wires required. Cablecos, who already install fiber close to the residence, could also use 5G instead of installing coax to and inside the residence. It is still not clear whether service providers will use 5G to connect each device to the internet or whether the 5G cell will connect to a router in the home, which will then connect to each device via WiFi or a wireline home network. Verizon boasts about having built the US’ “best” 4G network. It was the first major telco in the world to build an all-fiber network – albeit in only 70% of its copper wire footprint. The cost of installing fiber over the last mile to the home may have prevented it from going all-fiber throughout its entire wireline footprint. 5G could solve that problem. It could also allow Verizon to offer high-speed broadband outside its wireline footprint – wherever its recently acquired XO Communications fiber rings exist. That would for the first time put Verizon in direct competition with AT&T, who could also do the same by building more fiber networks to near residences. Verizon could become a nationwide broadband powerhouse, something that’s sure to have Comcast and AT&T thinking about doing the same. Verizon is simultaneously building a media company with the AOL and Yahoo assets it acquired, a media company that it is positioning for streaming content to millions of consumers. McAdam said Verizon can add 5G to its existing cellular network for very little additional cost because it will densify its existing 4G networks with small cells. Verizon said it will later on test use cases for mobile 5G that supports the “massive” scale and low-latency that IoT services require. Other cellcos such as AT&T and Korea Telecom (KT) are working to begin deploying 5G sooner than its 2020 forecast date. AT&T is pressured by Verizon and AT&T’s own massive and costly effort to upgrade its aging wireline broadband network to all-fiber and to G.fast over existing copper phone wires to MDUs. KT is pressured by the upcoming 2018 Winter Olympics that South Korea is hosting. Japanese cellco NTT DoCoMo is testing 5G for the real-time transmission of 8K video. It completed tests with Nokia on May 19. The tests used beam-tracking techniques to transmit millimeter wavelength signals at the extremely high frequency of 70 GHz. The trial showed that 8K video of 48 Gbps, which is four times larger than 4K video and 32 times than 1080p HD, was transmitted without any delays. Japan hosts the 2020 summer Olympics and wants to show off wireless streaming of it in 8K. McAdam said Verizon is moving ahead with cities such as Boston, San Fran-cisco and others on a one-fiber strategy for both cellular and FiOS. He said, “no longer are discussions solely about local franchise rights, but how to make forward-looking cities more productive and effective” and that its deal to acquire XO’s 40 metro fiber rings in major cities is the key to this strategy.